Engineered to stir the soul, the RC is one of the most beautiful sports coupés ever created. Fusing leading edge design with world-class craftsmanship and advanced technology, it is great fun to drive. Powered by pioneering Full Hybrid or petrol turbo drivetrains, the RC delivers exceptional response, combined with astonishing agility. Intuitive Lexus equipment includes Touch Pad and Pre-Crash Safety. 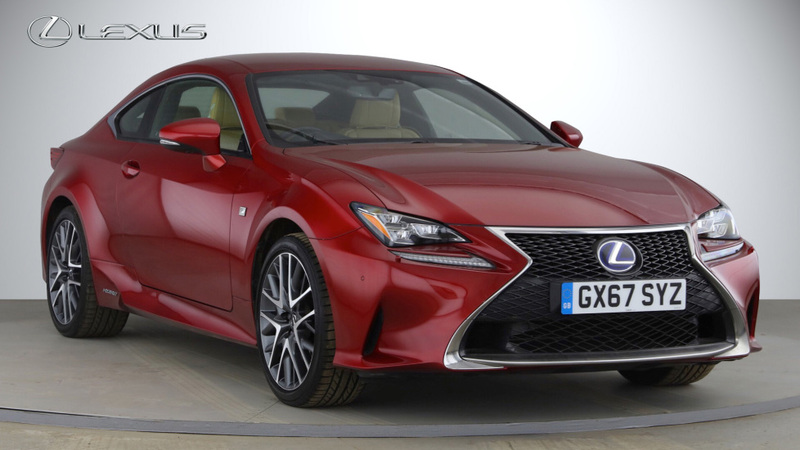 For a more dynamic experience, the RC F SPORT models have Adaptive Variable Suspension, 19-inch alloys and F SPORT steering wheel. With its exquisitely stitched sports steering wheel in your hands, in the RC you’ll enjoy lively acceleration and precise handling. Developed on the Nürburgring, the world’s most demanding racetrack, this groundbreaking sports coupé features an extraordinarily rigid chassis. This, combined with race tuned suspension and innovative drivetrains, raises the bar for driving refinement – offering you an unforgettable experience that is nothing short of amazing.